The ASUSTOR AS5002T is the first Intel based network attached storage (NAS) device tested at Missing Remote. So, I was very curious to see how its dual-core 2.4GHz Celeron J1800 would stack up against the strong showing we’ve seen from ARM Cortex-A15 based systems recently. With two Gigabit network interface cards (NIC), two bays, 1GB RAM, and USB 3.0/eSATA support, on the surface the $315/£185 AS5002T aligns nicely into the same category. But, it also offers a few features that are not found on similarly priced ARM devices: most notably, virtualization, hardware assisted transcoding, and Kodi integration. Offering the potential for this SOHO NAS to also be a well featured home theater PC (HTPC). The ASUSTOR AS5002T packaging is plain and serviceable. It does a good job of protecting the NAS properly and provides an overview of the device’s main features. It also lets buyers know what they are missing by selecting the AS5002T over an AS5102T (1GB of RAM and disk tray locks). But, do not despair –RAM is user upgradable. Which will be very handy when we test out virtualization support. The ASUSTOR AS5002T’s exterior is not flashy, unless you count the LEDs. Normally I would complain about this. However, ASUSTOR has generously provided a mechanism to control brightness. Or, you can turn them off entirely (important for HTPC use) so only gratitude is required. External expansion is available via three USB 3.0 (one front, two back), and two USB 2.0 / two eSATA ports on the rear. Rounding out the inputs, we have a power jack, dual Gigabit Ethernet LAN, and a Kensington lock slot are also found on the back. Internally, there is space for two hotswappable 3.5” drives (2.5″ will also fit) and two DDR3L RAM modules. Upgrading the RAM is quite easy, only requiring the removal of three Philips screws on the back. This must be done either via a single module or matched pairs. There is a minor complication because ASUSTOR put a bit of glue on the included module’s release tabs, so a bit of chipping and cleanup is required. While the box will boot with 5GB (4 + 1), it will not make it past the BIOS. A modern HTPC requires HDMI, which the AS5002T has (1.4a), but it also includes an IR receiver and TOSLINK S/PDIF to round out its media capabilities. The ASUSTOR AS5002T includes a user visible BIOS with several options. This might be handy for troubleshooting, but as the AS5002T was very stable during testing so there was not much that I found terribly useful here. First-run started a bit rough, with the ASUSTOR AS5002T not appearing automatically on the network in Windows Explorer. ASUSTOR does provide an app to find it, so that was used in lieu of looking at DHCP assignments. It worked, but it seemed an overly tedious requirement when UPnP advertisement or something similar would have provided an easier alternative to downloading an application that will only be used briefly. Once found, the process was well managed and simple. The only complaint I have is that the initial configuration wizard dumbs-down RAID selection a bit too much. This would not be that much of an issue if the lexicon (“Maximum capacity” v “Balanced” with no mention of RAID0/1) was not abandoned within the device administrative UI. It would also be my preference to have “Balanced” (RAID1) as the default because I believe this to be the right choice in 99% of scenarios. It is also worth noting that the ASUSTOR AS5002T updated to the latest firmware version as part of the first-run, so kudos for that. The ASUSTOR AS5002T provides an amazingly rich administration and application platform. I try to be as thorough as possible in reviews, but even in the few weeks spent with the device digging through the feature set I know that there are still many corners left unexplored. There is simply an incredible amount of flexibility available from this device and the ASUSTOR ecosystem. Calling out a few, it provides all of the basics generally found on SOHO NAS like iSCSI, VPN client, user and access control list (ACL) management, share configuration, link aggregation, and power options. Unfortunately, it does not provide time based file snapshots, which are sorely missed; although it is possible to schedule folder backups to external drives or alternate file shares on the device itself as a workaround. The ASUSTOR AS5002T did an excellent job of keeping itself up to date. 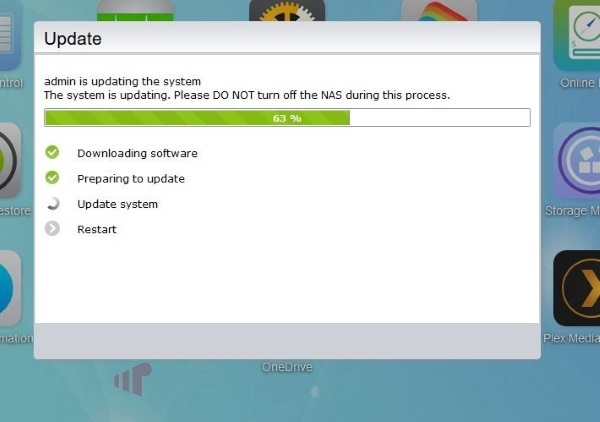 In the short time I have had the NAS here, it has received at least three updates, including the one applied during first-run. It is great when a company continually delivers software updates. Even better when they keep doing it past the first year after release. The ASUSTOR AS5002T provides connected device features that make it play well with UPnP enabled routers, and publishes external dynamic DNS, making it very easy to use and access the NAS outside the home/office. Unfortunately, one convenience aspect of this feature was not reliable at all. In fact, even though “Cloud Connect” claimed “Available” status, I was not able to actually use it to connect in any of the ASUSTOR mobile apps tested. Not a huge issue though, as the dynamic DNS hostname is “Cloud ID”.myasustor.com, but still quite frustrating that it did not function. Should you have a UPnP-less router (or have UPnP disabled), ASUSTOR publishes a convenient list of all the ports the NAS/Apps require, simplifying the DIY port forwarding process. ASUSTOR asked me to take another look at the Cloud ID issue, and now it is working correctly. It is unclear to me why it was not during testing, and now is. Probably just one of those ghost in the machine things :). As I dug into the ASUSTOR AS5002T, it quickly became apparent that it is not a typical NAS device. This is especially the case when it comes to device support. Besides the obvious things like HID (human interface device) keyboards/mice, it also supported USB Wi-Fi and Bluetooth dongles making it possible to connect wirelessly to the network, and support Bluetooth devices. I am curious how broad the Bluetooth support is as I only tested with a keyboard. It would very interesting to see if headphones or other media devices are also functional. I was able to find one USB device that was unsupported. My trusty RC-6 (i.e. Microsoft Windows Media Center eHome) IR receiver. Although in all fairness, since the AS5002T includes an IR receiver, it is not a huge loss, but the number of buttons and ability to physically separate the NAS from the line-of-site (LOS) control were missed. 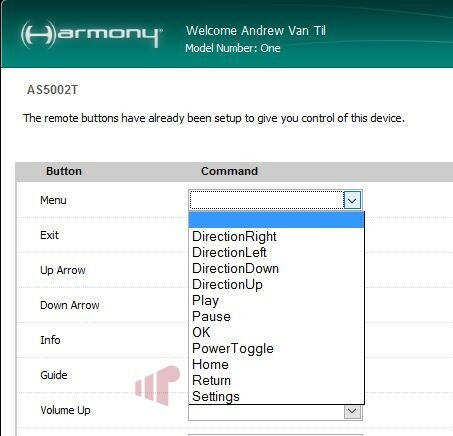 Fortunately, the ASUSTOR AS5002T IR profile is available in the Harmony database, making it unnecessary to procure an ASUSTOR remote. The available button count is not that large, but generally serviceable for use to drive the device UI and most Kodi functionality. There are options available for two-way Cloud synchronization as well. With support for major players Amazon S3 and Microsoft OneDrive alongside roll-your-own FTP and RSYNC targets. External drives cannot join the redundant storage pool, but ASUSTOR is not alone in this limitation. It is unfortunate as eSATA drives are functionally equivalent to a hot swappable SATA drive; especially on a two-bay NAS like the AS5002T. Also, like other two-bay storage devices, reconfiguring the storage array requires destroying and rebuilding it, so plan wisely during first-run. Along with client VPN support, there is also an option to install a PPTP/OpenVPN server. A great feature should your Wi-Fi router not provide this capability. ASUSTOR provides an overwhelming number of mobile apps (shown here for Android). I did not test them all. Frankly, I am not sure why all of these apps exist, and I think it would be better to put some effort into consolidating the myriad functional silos into just a few apps that do more stuff. Of the list, I found AiMaster to be quite useful for managing the AS5002T and AiData provides a decent way to move files between the NAS and mobile devices. Feel free to explore yourself, just make sure to bring along plenty of provisions. Based on a modern Intel Atom platform, the ASUSTOR AS5002T has Intel Quick Sync enabled on the device. You will need to install the “LooksGood” application (shown next) and use the AiVideos mobile app to use this feature. On my local network, support is nothing short of fantastic. ASUSTOR suggests using MxPlayer, but I found that Kodi was much more full featured (i.e. better audio codec support) and I was able to watch [transcoded] 23.5/48Mbps (video/overall) 1080p24 content on my phone over Wi-Fi all over the house. Unfortunately, as the ability to transcode to lower resolutions was not provided (it should be there, but was not working for some reason) LooksGood + AiVideos was not suitable for viewing content while not at home. I also noticed some issues with ISO files, where LooksGood+AiVideos does not treat them as a container and pushes, er… attempts to push, the entire untranscoded file at the player – crushing it. Besides mobile device transcoding, LooksGood should also enable browser based hardware accelerated viewing and automated or on-demand transcoding to file targets. Unfortunately, I was not able to make either of these features work successfully. Browser based viewing failures appear to be due to security changes in modern browsers (neither Firefox nor Chrome would load the VLC plugin due to its architecture), but the file targeting is somewhat of a mystery – potentially due to audio codec issues. Either way, the end result is the same. It is nice that the feature is there to enable mobile devices, but clearly it is in need of some polish to effectively compete with specialized streaming apps. Fortunately, two popular options are available. Both Emby and Plex are freely available through the ASUSTOR application store, and work as advertised given the hardware in the AS5002T. Even though both utilize CPU based software transcoding, I had better success with Emby’s ffmpeg based approach. Emby was able to target 720p 1Mbps for all content tested (1080p24, 1080i30, 1080i25, 720p60, 480i30), where Plex required stepping down to 480p 1.5Mbps to achieve the same level of buffering-free stability. I am unsure what it would take specifically for both platforms to utilize the underlying hardware transcoding capabilities, but as ffmpeg has recently added Intel Quick Sync support and Emby is working on it for the Microsoft Windows platform. So, hopefully it is something that can be enabled sooner rather than later, and could be as simple as ASUSTOR providing a build of ffmpeg with Media SDK (the API that enables Quick Sync) support compiled in. Unlike many NAS, the ASUSTOR AS5002T includes a GPU which drives an HDMI port. Simply hook it up like any other computer and you will see the device’s user interface. With options to configure (ADM), browse the web, manage virtual machines (if VirtualBox is installed), or kick back and enjoy some content via Kodi. If you just want to use it for one app (i.e. Kodi), there is an option to automatically load that app on startup. Kodi on the ASUSTOR AS5002T works exactly how I would expect it to work on HDMI equipped Intel Bay Trail (Atom) based hardware. Generally, all the things that Kodi is good at just click; high bit rate (HBR) audio bit streams, refresh rate changing, video plays well, Silicon Dust HDHR TV integration is available, PVR add-ins, etc. However, there are a few challenges consistent with this class of hardware. For example, it struggles with 4K content and some esoteric types like field interlaced VC1. But overall, the experience is that of a competent Kodi based HTPC – very similar to what one would achieve with OpenELEC. Well done! The ASUSTOR AS5002T also provides virtual machine support via VirtualBox, which provides an excellent use case for expanding the RAM past 1-2GB. Both Ubuntu and Windows Server 2012R2 were installed on the system, with Ubuntu getting the most mileage via the Mythbuntu distro. Enabling a fully functional MythTV install (with Kodi support) as a virtual machine (VM) on the ASUSTOR AS5002T J. 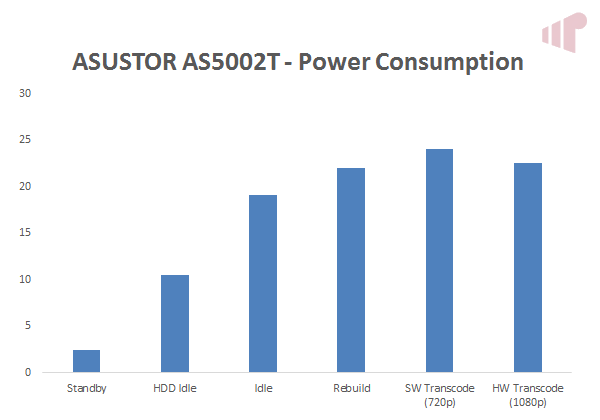 To test I/O performance, the ASUSTOR S5002T was configured with two 4TB Seagate ST4000DM000 in RAID1 (mirroring), and then large files were read from/written to the NAS over the network from one to seven clients with the average actual throughput aggregated in the following graphs. Here we can see the read performance of the ASUSTOR AS5002T in single NIC, link aggregation via adaptive load balancing (ALB), and ALB with 8GB of RAM installed (vs the 1GB the AS5002T ships with). Single NIC with 8GB of RAM was not included as the AS5002T effectively saturates the 1 Gigabit Ethernet link out of the box, so there would be no benefit from testing this configuration. As expected, there is a marked improvement in multi-client bandwidth when enabling link aggregation, but oddly a slight decline in ALB performance was noted after upgrading from 1 to 8 GB of RAM with fewer than six clients. Reversing the test for write performance, a similar trend is noted initially (with one client) then flipping to the more expected result as multiple clients add stress to the ASUSTOR AS5002T – more RAM, equals more performance, most dramatically with five clients. Bandwidth testing for external drives was not as rigorous, with read/write bandwidth only tested with a single client. Interestingly, USB 3.0 was significantly quicker, even though the external hard drives were very similarly spec’d – both 2TB 7200RPM drives with 64MB cache. Lastly, a quick look at power consumption in a few different states. Nothing unexpected, although I would have liked standby consumption to be a bit lower. Although, I suspect it is mostly an artifact of the power supply itself, because even when unplugged from the ASUSTOR AS5002T, it was still pulling 2.1W at the wall. 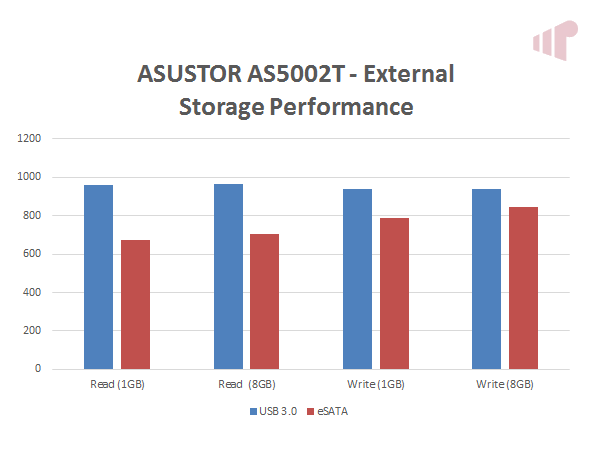 As a NAS, the ASUSTOR AS5002T is competent, well featured, performant, and stable. But, the real value is the incredible flexibility that the platform provides from its rich application ecosystem and the underlying hardware. Where competitive solutions mostly do one thing well, and that is great, this $315/£185 device is a good NAS, a good HTPC, and it has the ability to host VMs (i.e. a virtualized DVR) – fantastic. There are a few rough edges however, the biggest is that it does not support automated file snapshots. So, if time based file recovery is a critical feature, you may need to look elsewhere. Otherwise, the rest are really just niggles with an overly large catalog of ASUSTOR mobile apps which makes discovery more difficult than it needs to be, and the Cloud ID feature which should enable easier connection from outside the home, but just causes frustration. Thanks to ASUSTOR for providing the review sample. « UHD (4K) is easy. What’s UHD Premium?